which can be either gasoline or diesel is stored in a fuel tank. A fuel pump draws the fuel from the tank through fuel lines and delivers it through a fuel filter to either a carburetor or fuel injector, then delivered to the cylinder chamber for combustion. The fuel tank is the main storage for the fuel that runs the vehicle. Generally speaking, the gas tank is generally found at, or under, the rear of the vehicle. Sprays a fine mist of fuel into the combustion chamber of each cylinder or throttle body, depending on design. The fuel injectors are driven by the fuel pump and their job is to spray a fuel and air mixture into the combustion chamber, ready to be ignited to produce power to the driven wheels. The fuel injectors are basically a nozzle, with a valve attached, the nozzle creates a spray of fuel and air droplets (atomization). This can be viewed similar to that of a perfume dispenser or deodorant can in principle, spraying a fine mist. The Fuel Fill Hose is the main connector from the gas cap to the fuel tank. This is the point where the Gasoline (or other fuel) is put into the vehicle. B) that the fuel system remains pressurized correctly (in vehicles that use pressurized systems). 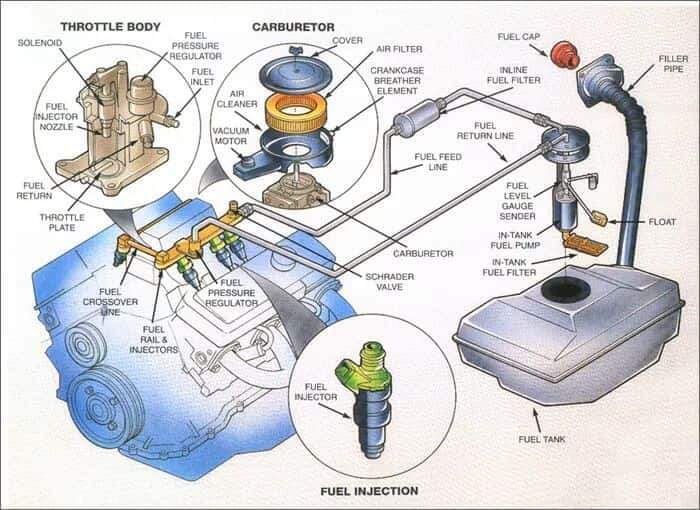 The fuel pump is used to pump the fuel from the fuel tank, via the fuel lines into the fuel injectors, which spray the fuel into the combustion chamber- in order to create combustion. There are two types, mechanical fuel pumps (used in carburetors) and electronic fuel pumps (used in electronic fuel injection). • Mechanical fuel pumps: these are driven normally by auxiliary belts or chains from the engine. • Electronic fuel pumps: controlled by the electronic fuel injection system, these are normally more reliable and have fewer reliability issues than their mechanical counterparts. The fuel filter is the key to a properly functioning fuel delivery system. This is more true with fuel injection than with carbureted cars. Fuel injectors are more susceptible to damage from dirt because of their close tolerances, but also fuel injected cars use electric fuel pumps. When the filter clogs, the electric fuel pump works so hard to push past the filter, that it burns itself up. Most cars use two filters. One inside the gas tank and one in a line to the fuel injectors or carburetor. Unless some severe and unusual conditions occur to cause a large amount of dirt to enter the gas tank, it is only necessary to replace the filter in the line. 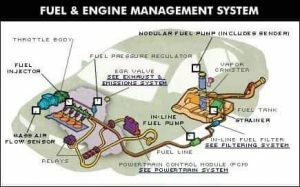 The Fuel Lines connect all of the various Fuel System components. Steel lines and flexible hoses carry the fuel from the tank to the engine. When servicing or replacing the steel lines, copper or aluminum must never be used. Steel lines must be replaced with steel. When replacing flexible rubber hoses, the proper hose must be used. Ordinary rubber such as used in vacuum or water hose will soften and deteriorate. Be careful to route all hoses away from the exhaust system. The fuel gauge exists as a display item in the vehicle’s dashboard. It is intended to show to the driver the actual amount of fuel in the fuel tank. On older cars, it’s common for fuel gauges (or their related part, the sending unit) to be inaccurate. When you first start driving your classic car take time to learn how accurate the system is. It’ll save you from a long walk to the gas station if you run out of gas! In terms of the fuel system, this may be your biggest headache. Sending units, at best, are generally a flawed design. 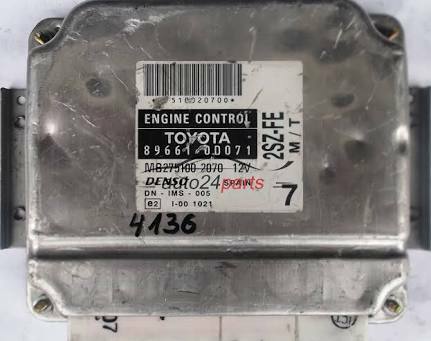 Generally, the sender is most accurate between 1/4 and 3/4 of a tank of gas. Outside of this, the gauge becomes progressively more inaccurate as you reach the tank limits (full or empty). They are generally the same types of line tubing as the main Fuel Line. These specific lines are used for a couple purposes. Primarily they are used to return excess fuel to the gas tank for recirculation. Additionally, they capture gasoline vapors, which, as they are pushed back to the gas tank cool and condense back into liquid. In particular, diesel powered fuel injected engines often use the fuel as a cooling mechanism for the fuel injector. They can recirculate significant amounts of fuel. These are often used in combination with fuel return lines. The goal of this section of the overall system is to ensure that gasoline vapors are not released into the ambient air. If this occurs a number of bad things may happen: 1) The earth-shattering kaboom of gasoline vapors igniting, 2) The unpleasant smell of gasoline is routed into the interior of the vehicle, and 3) It can harm the environment. Fuel Pressure Regulators are primarily found in fuel injected cars. Fuel injection, as opposed to carburetion, is a high-pressure system. The fuel pressure regulator ensures that the system maintains the proper amount of pressurization. As the fuel Injectors rapidly open and close in time with the engines OTTO cycle, pressure fluctuations appear in the fuel system. A Pulsation Damper job is to help combat the pressure levels reducing fuel delivery inconsistency. Some of this may seem a little silly, as many components are pretty obvious to all of us. Fundamentally, once you fill the tank with gasoline the system is “ready.” When you start the car the fuel pump begins the process of drawing fuel from the fuel tank, through the fuel lines and fuel filter, to the system that controls fuel/air delivery to the engine (a carburetor or fuel injector). While the car is running a continuous supply of fuel is delivered in this fashion. • Fuel is delivered from the fuel tank to the fuel injectors via a fuel pump and fuel lines. The pump is normally positioned close to the fuel tank or within the tank itself. 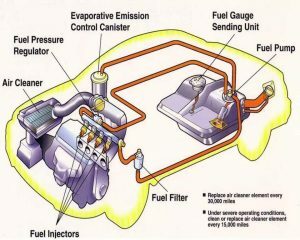 • Fuel leaving the fuel tank and fuel pump passes through a fuel filter which purifies and gets rid of any containment. This is normally a high capacity inline design, to maximize flow rates. 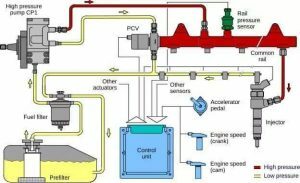 • Fuel travels along the fuel lines and is delivered to the fuel injectors. Fuel Injector pressures are controlled via a pressure regulator. • Any fuel which is not used and exceeds pressure rates is returned via fuel lines back into the fuel tank. The fuel system for this type of engine is generally a low-pressure system. If the vehicle is equipped with a mechanical fuel pump, the number of revolutions of the motor (RPMs) control how quickly fuel is delivered. The faster the car is going (or revving) the greater the movement of the fuel pump and the overall volume of fuel being delivered. 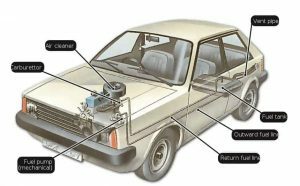 If the vehicle is equipped with an electric fuel pump the overall process is the same, but some form of the restrictor is necessary to ensure that the appropriate amount of fuel is delivered. This can be a pressure regulator, an overflow system with return lines, or a vehicle specific mechanism. 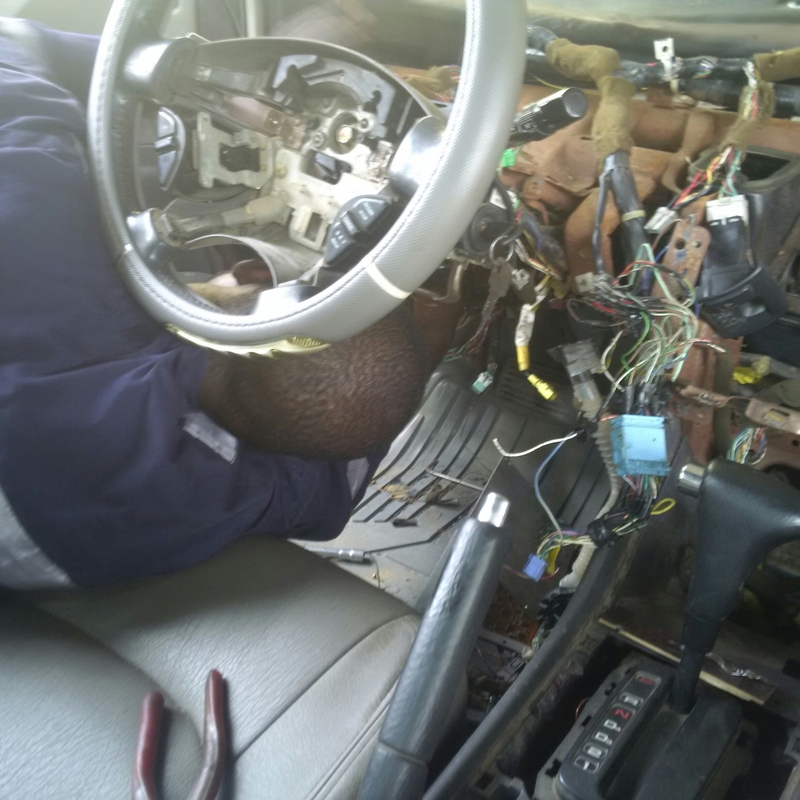 Once the vehicle is started, providing that the gas cap was installed and sealed correctly, the system becomes pressurized. Your modern car is probably fuel injected. Ever notice the release of air when you go to add gasoline? This is the vehicle releasing the system pressure. The electric fuel pump continuously pumps gasoline, ensuring that the system has the correct level of pressure. In addition to the normal fuel delivery, it also passes through the pressure regulator which ensures that the fuel pressure at the point of the Injector is correct so that the amount of fuel injected into the engine is appropriate. Depending on the year and the vehicle in question, the level of the technology that controls the system may be simple wiring type controls or a computer. 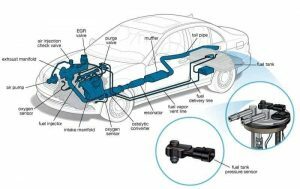 Emission controls are an add on to the basic fuel system and vary in complexity based on the year, vehicle, and legal controls in place at the time of manufacture. Fundamentally, they ensure that the appropriate amount of fuel is delivered, excess fuel is returned to the gas tank, and hazardous vapors are not allowed to escape the system. 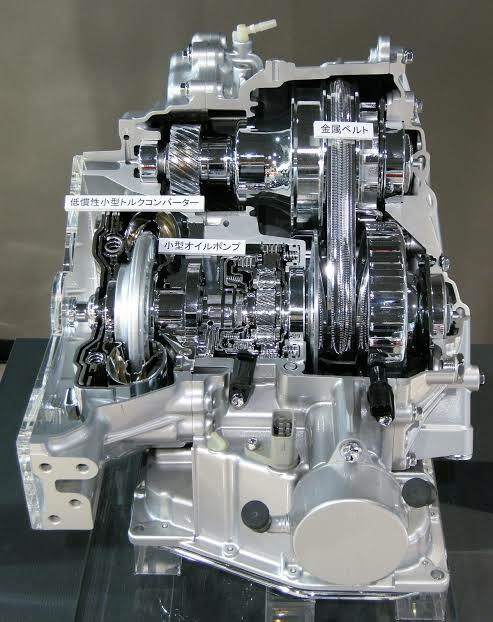 Because of the variability in this specific segment of the system, it isb important for you to review the technical information that specifically relates to your vehicle.